Comfy as cotton, but actually moisture wicking. Could it be any better? Well, it's from Germany so there's that. Turtle neck shirts are better undergarments than you'd guess. 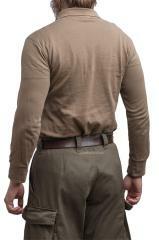 By raising, lowering or opening the neck you can effectively adjust the shirt for various conditions. This shirt is well made, durable and very comfortable to wear. It's a bit thicker than most T-shirts and has quite short sleeves as per German tradition. Material: 68% cotton, 32% polyamide. Works better than full cotton even when moist, but doesn't feel plasticky to the skin. 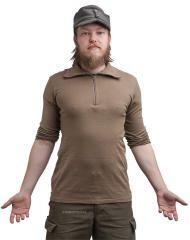 European standard sizes: divide your chest circumference (in centimetres) by two and beware of the short sleeves. Our model is 175 cm tall with a 95 cm chest, wearing size 46. Used, but in a pretty neat condition and smell like they were washed by your mum. Colours vary a little bit, but Coyote Brown is not far off. Erittäin miellyttävän tuntuinen paita. tilasin pari, hihat eivät olleet näissä yhtään liian lyhyet. Bought two of these, one as a mid layer and one that i can wear on its own. They fit great and are super comfy! The BW "Rolli" , like the french F1 shirt . In very good condition , it's alright ! thank you ! Do what they are meant to do. Nice shirt but, much shorter than expected. Erittäin hyvä poolo, omani on vuodelta 2014 ja hyvässä kunnossa. Ihoa vasten on polyamidi ja puuvilla sen päällä. Poolo näyttää ja tuntuu hyvältä. Hihat vähän lyhyehköt, mutta ei se ulkoillessa haittaa. Ei tämä ole yhtään sen huonompi poolo, kuin intin SA M91 ja maksaa 40€ vähemmän! Koko 48 vastaa mielestäni medium kokoa. Easily worth 4-5x more then it's price! Extremely comfortable and soft, the trick is to roll the neck down like in the second picture, otherwise it's a little unwieldy. I feel like buying 3 more of these. Pretty amazing shirts, especially at this price. i exclusively use these as pyjamas because they are so soft and because of their moisture wicking properties. Great condition, almost new. Fits perfect and SUPER CHEAP! Can not go wrong, pick one of these up ASAP! Bought this as I wanted a similar fitting shirt to a British army 'norgi' that I borrowed once; I actually like the BW shirt better. 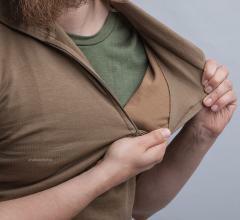 The Bundeswehr model differs as it is brown and is made from a stretchy cotton moisture wicking material, unlike the towel finish on the inside of a norgi. The collar can be unzipped and open to resemble a traditional collar, zipped and folded as a turtleneck, or zipped and unfolded to keep the neck fully protected. 44 fits a 34" chest and short arms perfectly, and the material is ridiculously soft and comfortable , the result of German space magic. I bought more than one so that I could use the other for pyjamas. At £3.99 each, these are a steal. Tosi mukava paita ja hyväkuntoinen, suosittelen! Pestyjä kyllä, mutta vähempikin pesuaine olisi riittänyt: tuoksahtaa muutaman pesukerran jälkeen vieläkin varusvaraston pesuaineelle. Tämä ei tosin ole huono asia, tuoksu on siedettävä ja tietääpähän, että germaanin hiki on taatusti poissa. Tosi hyvä hinta-laatusuhde! Very comfortable. 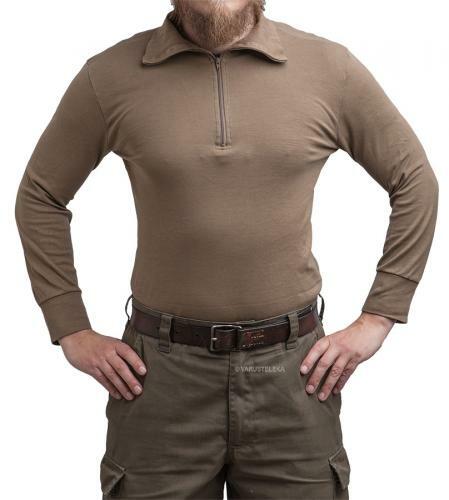 Excellent under shirt for outdoors . Just right indoors. Sleeves slightly on the short side. 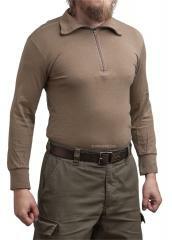 Honestly the most comfortable thing iv ever worn as a base layer versatile well made and cheap its a dream. Nice and comfy shirts! Size 44 is great for an 88 cm chest. Contrary to one of the picture subtitles, this shirt's hem is actually short (it'll probably come untucked while moving), and I'm only 168 cm tall.